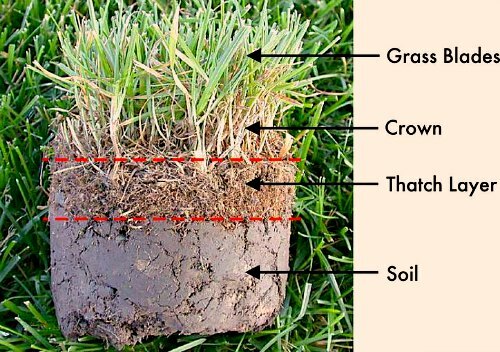 There are two types of thatch in your yard. Free Thatch – This type of thatch is composed of grass clippings and may need to be removed if build-up is excessive. This can be done with a Power rake (dethatcher) and is a good time to apply seed and fertilizer. Actual Thatch – This type of thatch is composed of living and dead grass plants and grass roots. A small amount of thatch (1/4 inch or less) is of some benefit to your lawn. It helps retain soil moisture and holds sod together when it is harvested. Actual Thatch accumulation of more than 1/2 inch can be harmful to your lawn, because grass plants will grow in the thatch, rather than in the soil. In a dry spell, this large thatch layer will completely dry out and the grass will die. When an actual thatch layer is developing, aerate at least once a year with a “plugger” type aerator and put down a Winter Feed Fertilizer application. George Hass Better Lawns ©2019. All Rights Reserved.